A so-called Free Speech Rally organized by neo-Nazis, white nationalists, and white supremacists in Boston today has not gone as the hater’s expected: An estimated 15,000 counter-protesters showed up Saturday at Boston Common to stifle a much-smaller Free Speech Rally scheduled for noon. 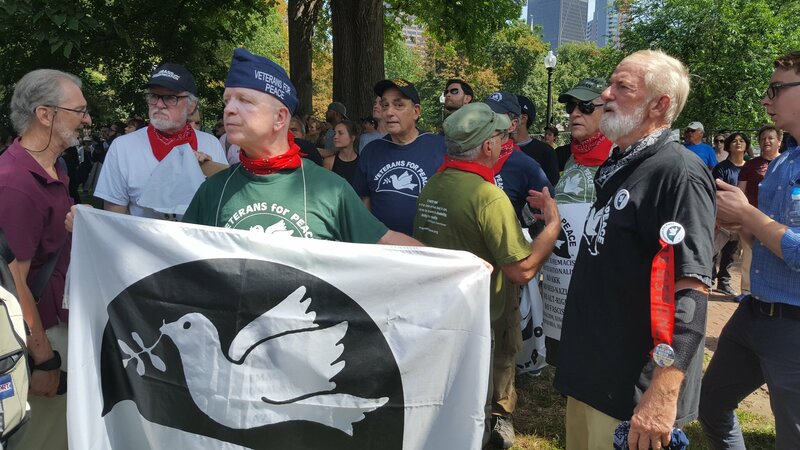 Veterans for Peace are among the groups protesting the hate speech rally. Among the thousands of people who are there to protest the hate are members of the local chapter of Veterans for Peace. In previous demonstration, Veterans for Peace members have been known to get in front of protestors or counter-protestors when violence breaks out, not fighting back, simply taking the beating or pepper spray, et cetera. “As president of the United States and as a Republican, I reject the support of white supremacists. The country that defeated Hitler’s armies is no place for Nazi flags. The party of Lincoln won’t stand with those who carry the battle flag of the failed Confederacy.” —Schwarzenegger’s suggestion of what Donald should have said. Schwarzenegger suggested we all donate to our favorite anti-hate charity. He’s also authorized a t-shirt sales of which will raise money for the Simon Wiesenthal Center: Arnold Schwarzenegger “Terminate Hate” Tee.